Notes: Designed by A.K. Best of Boulder, Colorado. A.K. 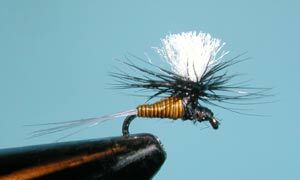 prefers to use dyed Stripped Quills or Turkey Feather Biots for the body rather than dubbing to get a more slender profile. 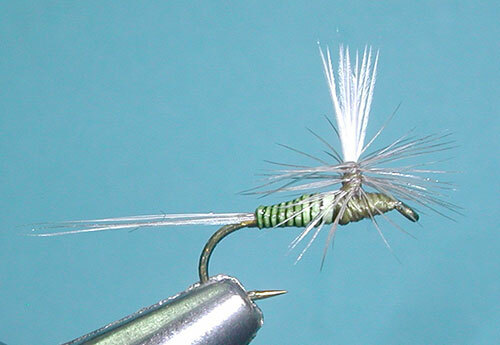 Both, Turkey Biots and stripped quills, are dyed with a number of colors to match any mayfly. He also prefers to use Turkey Flat feathers for the parachute wing. Traditional materials such as Calftail or Poly Yarn produces a large bump where the wing is tied into the shank. 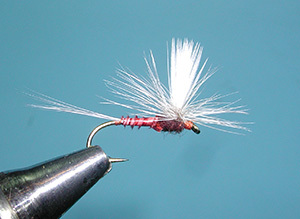 This is a problem on the smaller baetis patterns. 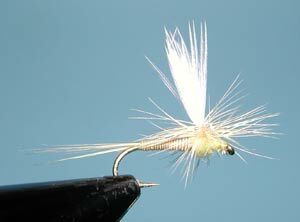 In addition, the use of a hair wingpost usually has a weight distribution problem on the small baetis patterns that cause the fly to tip on its side upon the water. A.K. 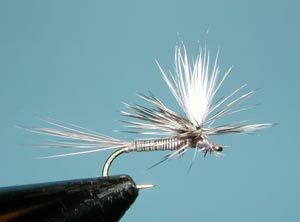 likes to use the Turkey Flat feathers that are 2-4 inches long. They compress well, needing fewer thread wraps, lighter than Calf Hair, and more durable. 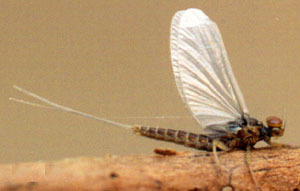 Patterns of particular mayflies vary by the selection of the quill, hackle, and tailing fibers.